Brod, a researcher on our Threat Research team has been tasked with tracking emerging Mac based threats. Microsoft Excel is one of the tools he uses to chart variants. 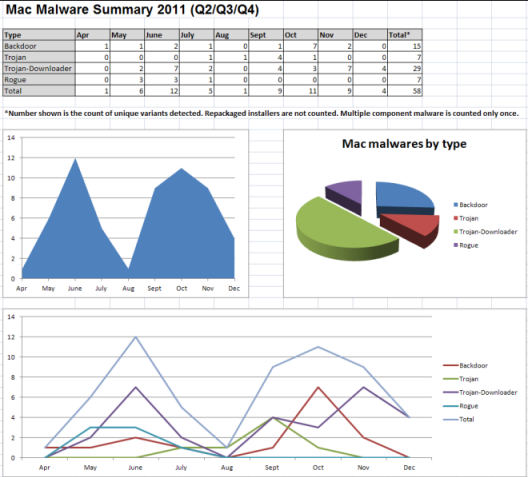 From April to December 2011, there have been several dozen new Mac threats. Well, that's nothing when compared to Windows malware — but it's definitely something when compared to the number of Mac threats seen prior to 2011. Keep in mind that by "new", we're referring to unique variants, and not the raw number of unique binaries that we've seen. We prefer a more conservative approach when counting malware. The more generic and family based, the better.